개요: Once a hyena couldn't choose between two paths and died trying to go down both. God loves us and sent His Son. Choose Christ. 이 스크립트는 다른 언어로 번역 및 녹음을위한 기본 지침입니다. 그것은 그것이 사용되는 각 영역에 맞게 다른 문화와 언어로 조정되어야 합니다. 사용되는 몇 가지 용어와 개념은 다른 문화에서는 다듬어지거나 생략해야 할 수도 있습니다. You all know what a hyena is. Well, once upon a time a hyena came out at night in search of food. It was not long before he smelled some fish near the river. So he went to look at it. But before he reached it, he smelled some meat on another path. So he left the path to the fish and followed the path to the meat. Then he decided that the fish would surely taste better. But he had not gone far on the path to the fish before he thought of the meat again. He did so want both the meat and the fish. So he made a plan. He put his two left legs on the left hand path and his two right legs on the right hand path. Then he started to walk until his legs stretched further and further apart. Then, suddenly,--his whole body split from head down to tail (accompanied with appropriate sounds). God had an only Son whose name is Jesus. He came to this earth to save us from death. He taught us that there are two paths on which a man can walk. The one leads to death, and the other leads to eternal life. All those who love their sin are walking on the path that leads to death for God says, "The soul that sinneth, it shall die." But God loves the sinner and it is not his will that any should perish. He loved the sinner so much that he sent His only son, Jesus, to die instead of the sinner. By His death, Jesus made a new way that leads to eternal life. 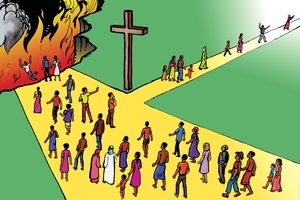 Jesus said, "I am the WAY, the TRUTH, and the LIFE.." If you really would like eternal life, come to Him...confess your sin, and He will set your feet on this new path. On God's way, there can be no death! Perhaps some of you, like the hyena, are hoping you may be able to walk on both paths at the same time. You love your sin, and you also want eternal life. You must choose either Life or death. Will you not today confess your sin to Jesus? He will pardon you and cleanse you of your sin. He will give you Joy and Eternal Life. GRN has recorded a version of this script in 12 languages and dialects. See full list. If you have any comments or suggestions about this script, GRN Language Hotline에 연락해 주세요.